Apple recently hit the trillion dollar valuation (slightly behind schedule) and you may be wondering why. 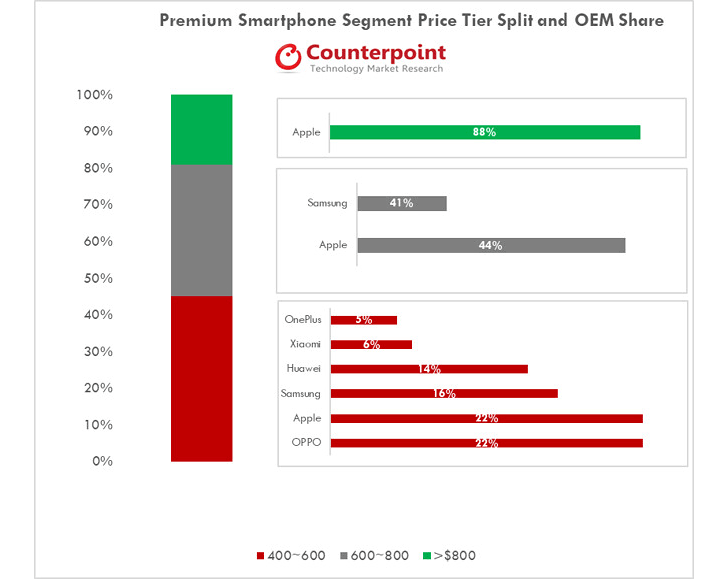 Counterpoint Research has two charts that will quickly explain it – Apple took in 62% of the global profits from phones during the second quarter of this year. That’s $6 billion in profits on $30 billion of revenue. The Q2 profits of chief rival Samsung have been falling for the last three years and it took home 17% of the global profits, less than a third of what Apple made fro its phones. Meanwhile Chinese brands have been growing steadily with Huawei and Xiaomi getting a huge boost this year. It’s easy for Apple to have good profit margins – nearly all of the phones costing $800 or more were sold by Cupertino. The $600-$800 segment is a fairly even split between Apple and Samsung (it’s 44% vs. 41%, the chart makes the difference seem much bigger). Samsung’s numbers declined recently as the Galaxy S9 underperformed. It’s the $400-$600 segment where the Chinese brands show their strengths – after all, most of them sell their flagships at these prices. Here Oppo matches Apple, Huawei nearly matches Samsung and OnePlus and Huawei fight for the leftovers.